I met Peter Heeschen in his cozy countryside house outside the city of Odense on the island Fyn in Denmark. It was a warm summer afternoon in 2001. I knew about Peters pipes from the net and from a friend who was lucky enough to own one of his pipes. But I didnt own one myself. I had announced my visit four hours before, and was greeted welcome by Peter and his wife in the shade under the vines in their courtyard. I have read several places on the net, that Peters pipes breaks in at the very first bowl - and they really DO.... A Heeschen pipe becomes your friend, if not at first sight, then at least at the first bowl. Apart from being such great smokers, the pipes Peter makes are so good looking and almost gentle to hold - nice and smooth, round and almost organic in shape (especially the famous "P"-shape) and with a finish that is excellent. 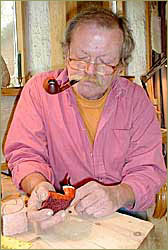 If you are thinking about getting a Peter Heeschen pipe, don't think twice - just do it. It will become your friend and fellow companion for years to come. You can read my review of my first Heeschen pipe elsewhere on this site, where you also find reviews by G.L. Pease and Paul Tatum.